This first photo is the scraps I received from Debbie. I asked for a rainbow of colors and boy did she accomplish that task! You can visit Debbie at her blog A Quilter's Table. 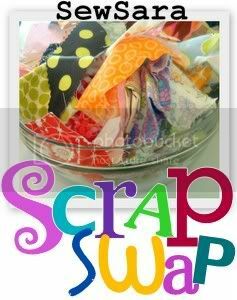 Quite a few of these scraps are going to end up in my Bottled Rainbows quilt. Scraps received from Debbie, I just love the fourth one in from the right! The next two photos are the scraps that I received from Sara (yes, the lovely lady who hosted this scrap swap!) I love the collection, and I absolutely adore the large chunk of IKEA fabric that she sent to me, it was quite the treat! Click on the little mushroom below to go to her blog. Scraps received from Sara, it is quite the collection! Large chunk of Ikea fabric from Sara. I LOVE IT! The last set of scraps I received were from Laura, she has a blog called Quilting Fun, you can visit her blog HERE. She sent quite the array of fabrics, they are all so unique and pretty! My favorites are on top, the purples/pinks and the turquoise/blue with the bees! Scraps from Laura, I am in love with the purples on top! Thank you ladies for making this so fun and successful! 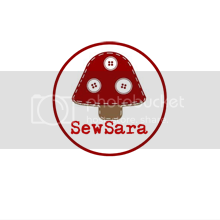 I hope Sara does this swap again, because it really was a fun experience, and a great way to meet new people out in the blogging community! Great fun! Loved swapping with you, and as you said, "meeting new people out in the blogging community." Thanks again! Great Post. I am so glad I got involved in this swap, too. I am happy to know you liked the fabric I sent.